Microsoft's annual 10-K filing has some interesting data points that could provide more clues about the state of its device business. Microsoft reported $853 million in revenue from Surface RT/Pro, which was lower than the $900 million charge it took for Surface RT inventory and the $898 million it spent on advertising the Surface and Windows 8. The obvious observation here is that Surface devices have been a financial sinkhole for Microsoft. But aside from this, the figures may also help us gauge the relative performance of the Surface RT and the higher-end Surface Pro. The chart above shows the state of Microsoft's inventory levels since the launch of the Surface line of devices. The consistent increase in inventory levels signals weak sales. But we already know this because of the $900 million inventory writedown. The interesting part is the state of inventory in fiscal Q4 - Overall inventory was roughly flat even after the writedown, which means actual inventory was still rising. Given the umsold Surface RT inventory, it is highly unlikely that there were any further build plans for that product. This leaves the Surface Pro and the possibility of a new device launch in the near future. A ballpark ASP estimate would probably help us understand the cause of the rise in inventory. In order to directly arrive at an average selling price (ASP) estimate, we would need to take into account the product mix by storage, sales of the keyboard accessory and the discounting on the Surface RT as well, which would be extremely difficult. Instead, it may be easier to start with shipment estimates reported by IDC and calculate the ASP based on the reported revenue figure. IDC's estimates showed that Microsoft shipped a total of 1.8 million Surface RT & Pro models in Q4 2012 and Q1 2013. 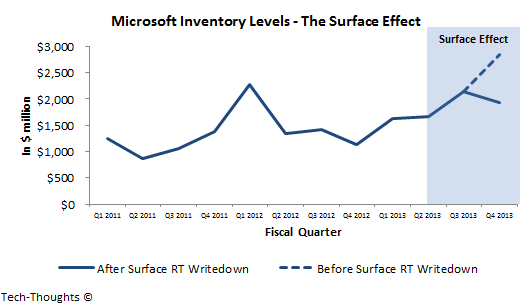 Given the channel inventory problems being faced by the Surface RT, we're unlikely to see anymore shipments. Even if Surface Pro shipments come in between 0.2-0.5 million in Q2 2013, we end up with an ASP between $370 and $430. If we assume no Surface shipments in Q2, we get an ASP of about $475. This is quite unusual because the base version of the original Surface RT was priced at $499 without the keyboard accessory, while the Surface Pro started at $899. Surface RT discounts only came into effect a few weeks ago and are unlikely to have a major impact. This suggests that Surface Pro sales have been extremely poor and both Surface variants may have suffered from high returns, which would certainly explain the inventory pattern in the latest quarter. If this continues, Microsoft may be forced into further inventory writedowns for the Surface Pro.